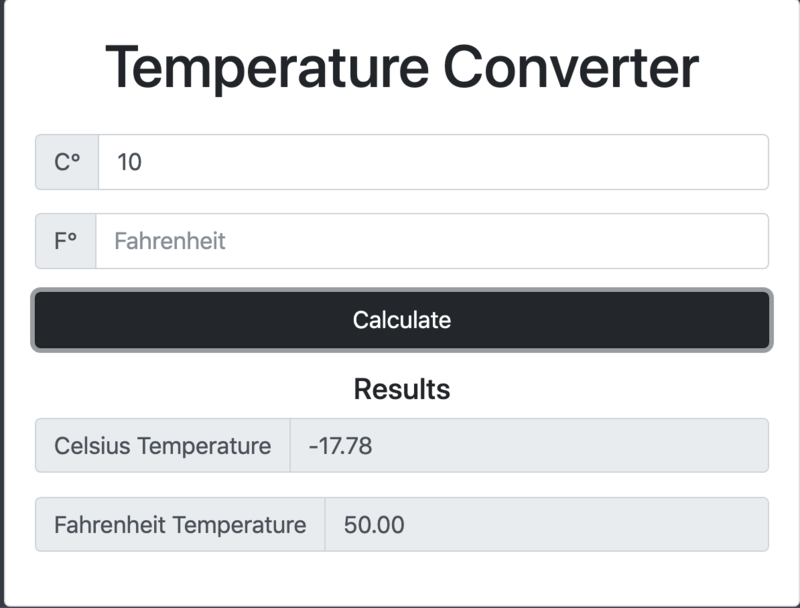 Despite not being linked (to my knowledge), when inputting the Celsius number, the Fahrenheit formula will run and be implemented to the Celsius output, with the correct formula being outputted on the Fahrenheit output, and vice versa when inputting a Fahrenheit number. Image I have tried several if statements but they only seem to work for one of the outputs with the other having no value result at all. Expected would be just to have one correct value appear in the corresponding output, this does happen, but an incorrect value appears in the unexpected output. The ternary operator works great for instances like this. We can simply change the value to an empty string when it's not the right/desired input. And for added measure clearing out the input boxes to 'reset' after each calculation.